Practitioners will plan activities to link in with the seven areas of The Early Years Foundation Stage Curriculum (EYFS). The EYFS is the very first stage of the National Curriculum and focuses on the needs of children aged between 0-5. The EYFS is split into three prime areas and four specific areas. All areas of learning and development are important and interconnected. The three prime areas are particularly crucial for igniting children's curiosity and enthusiasm for learning, and for building their capacity to learn, form relationships and thrive. Practitioners will plan a wide range of adult led and child initiated activities, both indoors and outdoors and will provide opportunities for children to learn in small or large groups. Continuous assessments will be made of how the children are progressing towards the early learning goals and feedback will be given to parents. Staff recognise that the children they care for may be at different stages of development and will take this into account when planning activities. When a child is between the ages of two and three, practitioners will review their progress and provide parents/carers with a written summary of their child's development in the prime areas. The summary will identify strengths and opportunities for development. Practitioners work alongside parents/carers to develop a personal target and plan to support their child’s learning and development. The Learning Journey will tell a story about your child’s on-going development and opportunities that they will experience throughout their time here and at home. This will tell a story about your child’s experiences, activities and friendships. Every child’s learning journey takes a personal path based on their own individual interests and experiences. 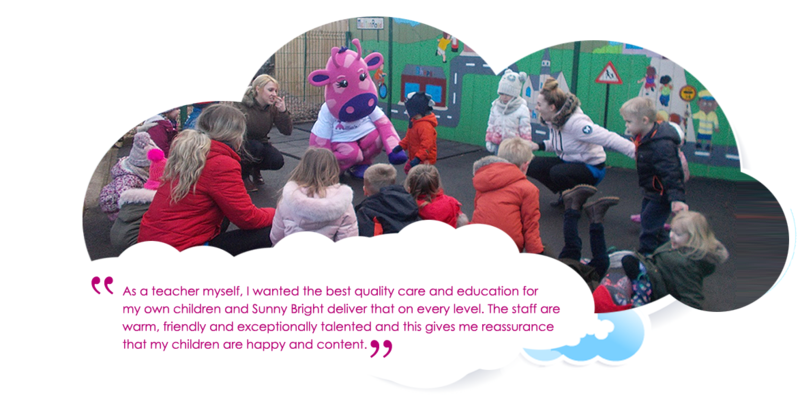 A key person meets the needs of each child in their care and responds sensitively to their feelings, ideas and behaviours. Develops a genuine bond with the children and offers a settled and close relationship. Having an effective communication with parents/carers, so there is a two way flow of information, knowledge and expertise between the key person and the parent/carers, so they can contribute to their child’s learning and development file. As your child transitions through the nursery their key person will help them to become familiar with the practitioners and their new environment. They carry out daily observations. Use observations to draw up an individual learning plan to further your child’s learning. Hold regular reviews with parents/carers. The local offer provides information for children and young people with special educational needs and disabilities (SEND) and their parents/carers. It explains to families about what they can expect from a variety of local agencies, including education, health and social care. Knowing what is out there gives these families more choice and therefore more control over what support is right for their children. For further information on how we support children with SEND, please click on the Doncaster Families Information Service link below.